The flat black LT-1R Rackmount Light from Middle Atlantic is a unique solution for poorly lit rackmount setups. This 1U rackmount unit features a pull-out ambient light that can provide evenly distributed lighting to facilitate viewing all the components in your rack. The unit is designed to be installed in your rack above the other units you wish to view. When the retractable light tray is pulled out it illuminates the face of the other components below it. The light itself consists of a dimmable LED light bar. LED lighting is known for its brightness, low-power consumption, and lack of ambient heat normally associated with incandescent lighting. The unit operates on a 120VAC/60Hz power supply. For even more flexibility, (2) 5V DC USB output ports have been included on the back of the unit for use with gooseneck work lights (LT-GN). These back ports afford the same lighting possibilities when working with connections in the back of your rack, an area that is often even more problematic in terms of lighting. This unit includes a UL-listed plug-in power supply. 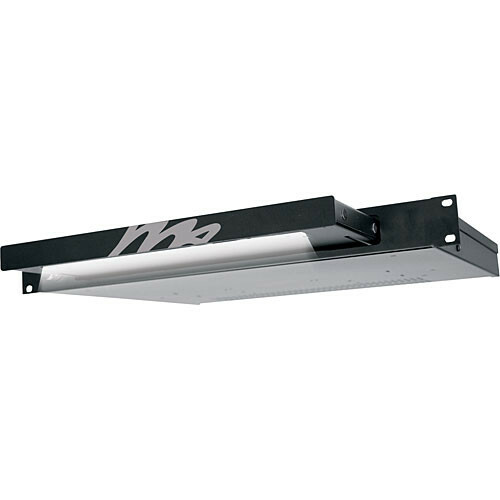 This 1U rackmount unit features a pull-out ambient light that can provide evenly distributed lighting to facilitate viewing all the components in your rack. The light itself consists of a dimmable LED light bar. LED lighting is known for its brightness, low-power consumption, and lack of ambient heat normally associated with incandescent lighting. For even more flexibility, (2) USB output ports have been included on the back of the unit for use with gooseneck work lights (LT-GN). Dimensions (HxWxD) 1-3/4 x 19 x 13.5"
Box Dimensions (LxWxH) 21.6 x 13.7 x 3.8"